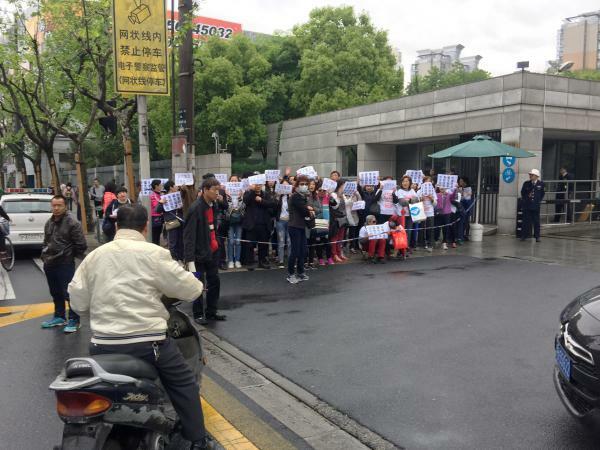 Investors in Zhongjin, a wealth-management company that collapsed this month, demonstrate outside a police office in Shanghai's Hongkou district, demanding repayment of their funds. Police later detained one of the demonstrators for distributing protest T-shirts. A pedestrian walks past the building on the Bund, Shanghai's colonial waterfront, that until recently held Zhongjin Capital Management. Police raided the firm earlier this month and arrested more than 20 company officials. The company signs have been torn down. Remy Xu put more than $150,000 of his family's savings into Zhongjin Capital Management, which police raided this month. Xu thinks the government shut down the company to protect state banks. "I've absolutely stopped trusting the government," he says. One recent afternoon, I was walking up Nanjing West Road, Shanghai's traditional shopping street, when I ran into a crowd of protesters being chased off by a plainclothes cop wielding a bullhorn and a line of uniformed police. Demonstrations like this in the heart of the city are rare and sensitive for the government, which fears political unrest as China's economic growth continues to slow. I asked a fleeing protester what had happened. "Don't walk alongside me," pleaded the woman, named Zhao, staring straight ahead. "The police will detain me." I slipped her my business card and, as I turned back toward the NPR bureau, I saw why she was frightened: a plainclothes cop was tailing her. He wore a black baseball cap and a black pollution mask that revealed only his eyes. Zhao and several dozen others were protesting the collapse of Zhongjin Capital Management, a wealth management company that police raided earlier this month, arresting more than 20 company officials, according to state media. The firm had amassed more than $5 billion in investment, much of it from ordinary citizens. More than 11,000 investors had poured their savings into the firm. "Zhongjin used fake businesses and exaggerated performances to gain investors' trust, promising high annualized returns and illegally raising money from the public," Shanghai police said in a statement. Zhao and the other protesters were targeting state-run Shanghai TV on the day I first met her. The station had given Zhongjin prime advertising space on one of its most popular shows, which led investors to believe the local government implicitly backed the company. Police detained a handful of demonstrators, including one who was grabbed by the throat, as captured on a cellphone video that protesters shared inside their chat group on Chinese social media. 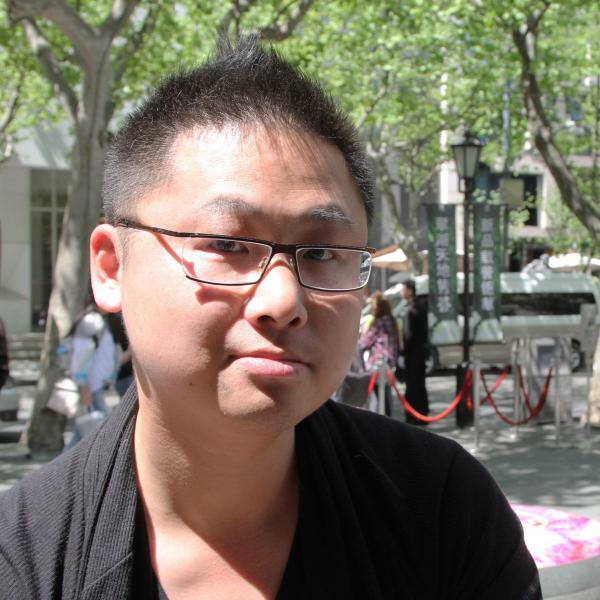 "The police are just like thugs," Zhao told me later. "They hit us. How can they treat us — who are real victims — like that?" Zhao, who'd sunk her life savings into Zhongjin, did not want her full name used for fear the government would retaliate against her for criticizing it. Zhongjin is one of three Chinese financial firms to collapse in the past year. In February, Ezubao, a peer-to-peer lending company, was exposed as a $7 billion Ponzi scheme. Police took over the headquarters of the Fanya Metal Exchange, a trading platform for nonferrous metals, late in 2015 and are investigating an alleged multibillion dollar Ponzi scheme involving more than 200,000 investors. Wealth management firms like Zhongjin emerged in China in the mid-2000s to provide more financing to private businesses and better returns for Chinese investors frustrated by low interest rates at government banks. But as China's economy has weakened in recent years, lending has continued to boom. Logan Wright, who oversees China markets research for the Rhodium Group in New York, says that's a recipe for trouble. "You have a slowing real economy, growing financial services sector and as a result, there's an increasing use of speculative strategies and riskier and riskier instruments and in some cases, outright Ponzi" schemes, Wright says. Shanghai now has more than 100,000 wealth management companies and the country has more than a million, says Iris Pang, a senior economist for greater China with Natixis, a French investment bank. She says China's government hasn't been able to keep up with the explosion in the number of firms. "The wealth management sector is very new in China," she says. "The regulations are loose and not very well defined." Customers say they invested in Zhongjin because there weren't better options, given last year's collapse of China's stock markets, a real estate property bubble and capital controls that severely limit how much money Chinese can move overseas. Zhongjin's investors say police have told them that only 10 percent of their deposits remain. The company's collapse has wrought havoc on families who benefited from China's three decades of extraordinary growth, but now are at risk of losing most of their savings. One investor, who asked not to be named, said her family is furious with her for persuading them to invest. She has since offered to divorce her husband. She has no money and is down to eating one meal a day. "I have a family problem, a financial problem and survival problem," she says, weeping. "Every time I take a bite of food, I feel very guilty. I feel I am wasting money." Zhao, the protester I met, is retired from a state-run factory that repaired clothing. She was drawn to Zhongjin's promise of 15 percent returns. At first, she made small investments. When they paid off, she put her life savings into the company and persuaded family members to invest as well. Now, she fears their money — more than $150,000 — is gone for good. Zhao blames the government for sanctioning the company, which maintained offices in prestigious locations here — including the Bund, Shanghai's colonial-era riverfront, and the Jinmao Tower, one of Shanghai's tallest skyscrapers. If they were illegally fundraising, Zhao wonders, why would the government have given them so many licenses to operate? "The government was backing them," she says. "That's why we trusted the company and invested the money. When we were signing investment contracts, we saw celebrities and local police officers also signing them." Beyond accusations of fraud, the government has said little about what led to Zhongjin's collapse. Remy Xu, another of Zhongjin's investors, has his own theory. He thinks the government shut Zhongjin down because firms like it are drawing away customers from state-run banks. 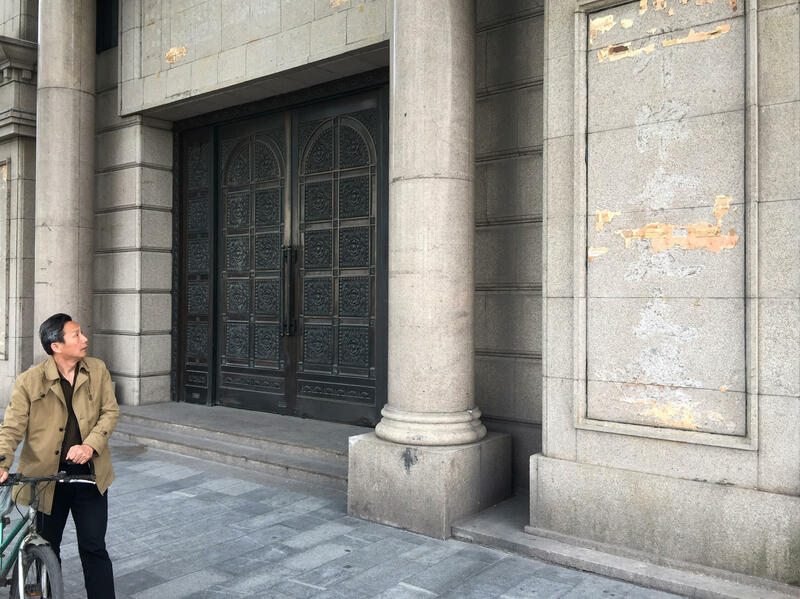 "Initially, the government supported this industry because it wanted financial innovation," says Xu, sitting outside a Starbucks in Xintiandi, a pedestrian shopping area in downtown Shanghai. "Financial companies like this sprung up like flowers all over the place. What's the result? Banks don't get as much money." Xu blames his family's financial losses on Chinese officials and is frustrated he can't do anything about it. His family sank more than $150,000 into the firm. "I've absolutely stopped trusting the government," says Xu. "I don't even trust the RMB [China's currency] now. I'm going to convert my future earnings into U.S. dollars or precious metals." Now let's report on a country Donald Trump often criticizes. China is stumbling through economic trouble, and here's a symptom. In recent months, Chinese police have raided three financial firms. Together, all three companies took billions from small investors. And now they're all accused of fraud. When one firm collapsed in Shanghai, the investors did not take the news quietly. NPR's Frank Langfitt reports on their protests. UNIDENTIFIED PROTESTERS: (Yelling in foreign language). FRANK LANGFITT, BYLINE: The protesters descended on Shanghai TV, the city's government-run station, demanding compensation and answers. They said Shanghai TV provided the financial firm, known as Zhongjin Capital Management, its stamp of approval by giving it plumb advertising space on one of its most popular shows. As seen in this cell phone video, police responded by detaining five protesters, grabbing one by the throat and chasing off the rest. Among them was a 65-year-old investor named Zhao, who fears she's lost her life savings. ZHAO: (Through interpreter) The police are just like thugs. They hit us. We are all human beings. How can they treat us, who are real victims, like that? LANGFITT: Police have accused Zhongjin of illegal fundraising. In interrogations, they've also told low-level employees it was a massive Ponzi scheme. But Zhao, a retired state-owned factory worker, says she put more than $150,000 into the company because the state sanctioned it. She asked NPR not to use her full name. She's afraid the government will punish her for criticizing it. ZHAO: (Through interpreter) If they were illegally fundraising, why would you give them so many licenses? The government was backing them. That's why we trusted the company and invested the money. When we were signing investment contracts, we saw celebrities and local police officers also signing them. LANGFITT: Wealth management firms like Zhongjin emerged in China to provide more financing for private businesses and better returns for Chinese investors, who were frustrated by the low interest rates at government banks. But as China's economy has weakened in recent years, lending has continue to boom. And Logan Wright says that's a dangerous formula. Wright oversees China markets research for Rhodium Group in New York. LANGFITT: Ponzi schemes. Zhongjin lured in investors with the promises of whopping 15 percent returns. But police say Zhongjin was just a shell company, and money was siphoned off. Iris Pang says Shanghai now has more than 100,000 wealth management companies, and the country more than a million. Pang is senior economist for Greater China with Natixis, a French investment bank. She says China's government hasn't been able to keep up with the explosion in the number of firms. IRIS PANG: The wealth management sectors is very new in China. They are kind of regulated. But the regulations are quite loose and not very well-defined. LANGFITT: Pang says if the government doesn't step in, she doubts the firm's more than 11,000 investors will get much money back. Remy Xu is another one of those investors. He's sitting outside a Starbucks across from a fountain in Xintiandi, a pedestrian shopping area in Shanghai. Xu and his family poured more than $150,000 others into Zhongjin. He offers another explanation for why the government shut it down. He thinks it's because firms like it were drawing away customers from state-run banks. REMY XU: (Through interpreter) Initially, the government supported this industry because it wanted financial innovation. Financial companies like this sprung up like flowers all over the place. What's the result? Banks don't get as much money. LANGFITT: Xu blames his family's financial losses on Chinese officials. XU: (Through interpreter) From the time this happened, I have absolutely stopped trusting the government. I don't even trust the renminbi. Now I'm going to convert my future earnings into U.S. dollars or precious metals. LANGFITT: Xu says there's little else he can do. XU: (Through interpreter) Ordinary Chinese people aren't like you Americans. If you're dissatisfied with the government, you can sue it or even ask the mayor to talk with you about it. That doesn't work in China. LANGFITT: As China's economic growth continues to slow, pressure could mount on more wealth management companies, legitimate or otherwise. And as the year unfolds, Iris Pang expects more firms to collapse. Frank Langfitt, NPR News, Shanghai. Transcript provided by NPR, Copyright NPR.